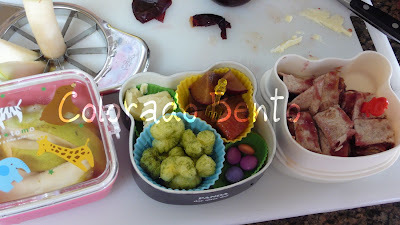 A really quick way to spruce up a bento lunch is with cookie cutters. It's really a win, win situation. 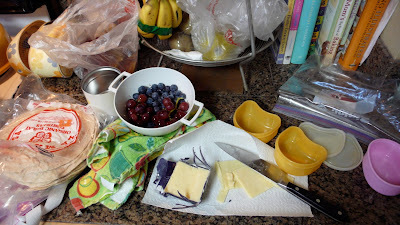 Don't go out and buy a fancy sandwich cutter for $5.00 when you can use items like cookie cutters, which most of us already have a plethora of in our home! I cut off the crust with the larger cookie cutters I have. Today it was a bunny (my daughter's favorite animal) and a hand. I just place them in at the same time to avoid the bread from splitting open to a point where it's not savable. Voile, a really simple way to be creative. If you take a closer look, all I did was cut up a blueberry to create a little eye for the bunny. My goodness, I might even be able to call this one cutesy. LOL! Confession Time, Secrets of A Gaming Mom... Say What?! Lately I've spent many days solo parenting. My husband isn't off on vacation sipping ice cold beers on the beach, he's working. Winter is busy season for a man that produces a ski movie. All of our family lives on the east coast. When J travels, I'm going it alone. Luckily the girls and I get into a groove, typically my only alone time is when they've turned in for the night. Some nights my eyes close just as fast as theirs and I'm asleep by 8:30. Did I really just admit to that? Other nights I relish those couple of hours of alone time. Instead of folding laundry, paying bills, or unloading the dishwasher, I like to decompress. When I'm stressed or overwhelmed, I occasionally draw a bath. More times than not I call a friend. Nightly, I'm relaxed by a few rounds of Words With Friends, reading blogs, spending time on the computer, or watching television. Our Connection To The Vancouver Winter Olympics, Way To Go Hubby!!! Today I want to take a moment to celebrate my husband's accomplishments. I've occasionally talked about my husband's job in the past, he puts his heart and soul into a feature length ski movie every year. Winter is obviously the most hectic and stressful time for him when it comes to his job, other than August when the film is being wrapped in Los Angeles. Lately I've been fighting the notion that bentos are this overwhelming idea that just creates another thing for us as mothers to do in the morning. How in the world am I going to find time to make a beautiful artistic lunch, when I barely have time to brush my hair before the school commute? I said it last week and I am saying it again, bentos don't have to be cutesy. I will admit bento lunch making while at it's most perfected art, is absolutely astounding. 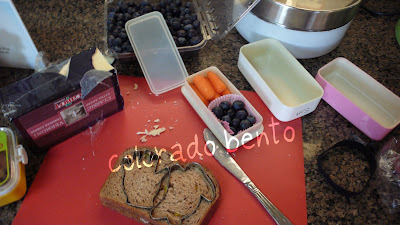 Here is a little glimpse into the bento world on Flickr. But for me, those artistic bentos are an aspiration at this point. They are incredible, but for me not realistic. Bentos Don't Have To Be Cutesy! Let me paint the scene, it's an average Thursday morning in my house. My school age daughter needs to have an inhaler treatment that takes about 15 minutes before she leaves for school, she also needs to take some medicine casually hidden in a smoothie, as well as get dressed, wash up, and eat breakfast. Thank goodness gracious she's awesome about doing her homework in the afternoons. I am juggling the medicine, the waistband that is suddenly too tight, and also food duty. I love bentos for the convenience. I can pick out a bento box, go to my drawer of silicone re-usable cupcake cups, and pull out some food and get right to it. Let me remind you, bentos aren't always cutesy and as of lately they are rarely cutesy! So take the pressure off yourself and focus more on the kind of food you are packing your children. You'll be seeing a lot more of Jamie Oliver, he's got a show coming on ABC called Food Revolution next month. If you are new to the food movement in America, it's happening. Wonderful people are trying to change the way our children eat and the way we choose to eat as adults, the amount of processed food and chemicals we put in our bodies, Jamie Oliver just happens to be one with a bigger platform. If you have a chance, watch this video. It's the speech of Jamie's Wish from the TED conference. Let's give our children a chance to outlive us, the way we are headed it's not happening for the first time in four generations. Our children's generation is expected to have a life span 10 YEARS shorter than ours. Can you fathom that? It starts at home people.... What are you COOKING tonight? I put my children's health at the top of my list, I invest in their health with the food I choose to put in their bodies. I would rather do with out a new cute sweater or a pair of stylish jeans so they can eat whole grain, minimally processed, fresh organic foods. I believe we need to rethink food in America and I am thrilled Jamie Oliver is championing the movement as his voice is powerful. Shower of Happiness For Renee!!! Sitting down to write this post, I had to reflect upon my connection with Renee and in turn of course many more connections. 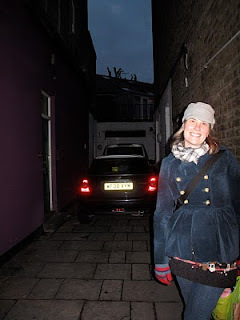 I started reading Renee's blog, But Why Mommy back in June of 2008! Sometimes it's easy to forget and time just seems to pass, but you really do get to know someone over the years through their words, their thoughts, and how they play Words With Friends (haha!). Renee is sitting on the cusp of one of the most exciting times of her life. Her patience is being tested beyond belief, but her will and devotion is beyond incredible. She knows in her heart her family will be growing soon and her son, Lion will be coming home to their family within the next few months. Lion is currently living in Ethiopia, but soon enough his place of birth and the first year of his life will just become part of his story. His family is waiting for him in the United States. Lion will come home to a loving mother and father, a wonderful intelligent and creative big sister Bunny. That may friends may be the longest title to date at Eat Play Love. Last week ended on a sour note, more sickness, more trips to the Doctor, and it just carried through the weekend. I was anticipating a nice weekend at home, my husband and I actually sharing a bed together for a night or two, and maybe even a nice homemade dinner complete with chocolate fondue on Sunday. The meals passed (I believe I ate, not sure if I could recall what exactly), there was lots of care taking, and here I sit in a state of vulnerability, pretty raw, worn down, and on the verge of tears. I'm uncharacteristically sensitive in this current emotional state and quite possibly just irritable enough to not be much fun to be around (try living with me). During our visit to New York, my husband and I spent a two days and an evening in New York City. 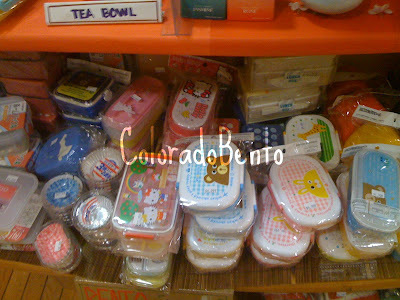 Of course, I had to find a couple of shops that carried bentos to bring back to Colorado. From my list of about five shops, I found two that were great resources, that I would highly recommend. I like to take photos of what kinds of bentos and supplies a store offers because it's often difficult to gauge if a store is going to carry what I am in the market for. Obviously stores are going to switch up their stock, but this is what you may come to find if you visit these two locations! Where have I been? In the past 16 days, I've been to the Doctor's office with my girls 4 times, for lung checks and for their cough/cold/fever. I've been to Children's Hospital Urgent Care 2 times. To top off all the fun my husband was in a remote part of Canada for 10 of those days, where I had one heck of a time reaching him to make him share in my misery. Yes, let's just say pretty much solo with two sick kids, luckily there wasn't much overlapping except for one night of surprise vomiting. Oh the joys of motherhood! So here's a list of the things that have been going on in my world. I have to get them out and by golly, it's turning into a blog post. Enjoy, boy I sure have. If fever breaks through, use Tylenol but repeat motrin at 6 hours. Happy New Year!!! I know, I know you don't need to check your calendar. This post wasn't published a month late, this post was published right on time, Monday February 1st. Today is officially the start of my new year. WooHoo! 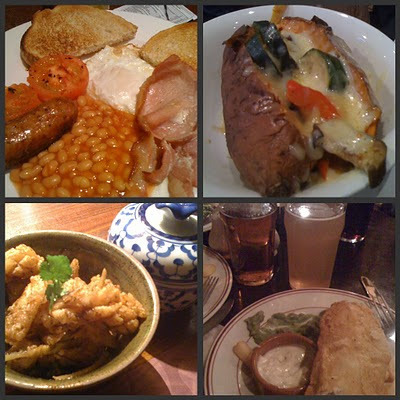 You see, we were in New York for New Years and then I picked up and got on a plane to London a week after I got home. All that traveling and rebounding from traveling threw off the first month of the year. So now I'm seizing resolve by the horns. January was a huge month for me and I've gained perspective going into the new year that I am excited about, which is how the new year should feel, right?